What Are Some Good Pop Up Stand Designs? Pop up exhibition stands are large format marketing tools designed to get your brand maximum attention and to enhance your exposure at promotional events. The wide graphic area provides you with unlimited design opportunities; but it is essential that you get the design right if your pop up display is going to get you the results you want. Every business is different and a design that works for one business won’t work for another. 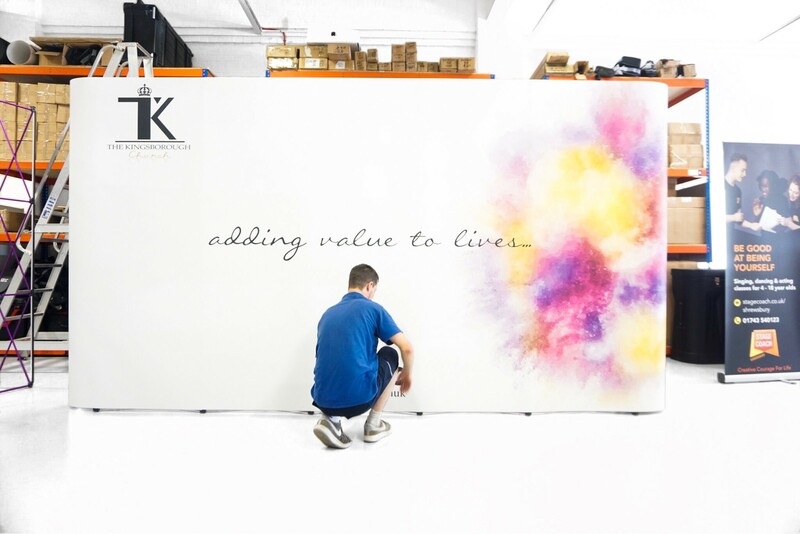 Here at XL Displays, we are the UK’s largest manufacturer of pop up exhibition stands and we manufacture hundreds of displays each month. This means we see a wide variety of graphic designs – all with different properties that work well for each individual brand. To help those who are unsure of where to start in terms of pop up stand design, we have selected a few pop up exhibition displays that we have produced; all of which for very different companies and with very different designs. This pop up stand duo for our client Dare 2b focuses on photography. This is a great aspect to put at the forefront of your pop up exhibition if your brand specialises in something which can be easily translated through imagery. Companies specialising in finance or administration might find it harder to capture their brand through the power of a photo purely because of the nature of their business. In comparison, clothing companies or events agencies may have a wider portfolio of strong pictures which would translate onto a pop up exhibition display well. It all depends on the brand and the marketing message as to whether or not photographs can work well as the focus of a pop up stand. For our client Dare 2b, their high resolution imagery worked superbly. It is worth noting that if you are going to use an image as a background, it has to be high resolution, 300 DPI and a JPEG. Sizing depends on the image itself. Anything less than the above will look pixelated and won’t print to a crisp, high definition finish. When an image is the main focus of a stand, text should be kept to a minimum. This is because if you have lots of text along with a bold, vibrant image, customers won’t know where to focus their attention and may be turned off visiting your stand. It needs to be simple with one focal point. Of course, text needs to be on your pop up display somewhere so that people know who you are and what you do. It is a good idea to have two core text components if you want to use bold imagery. 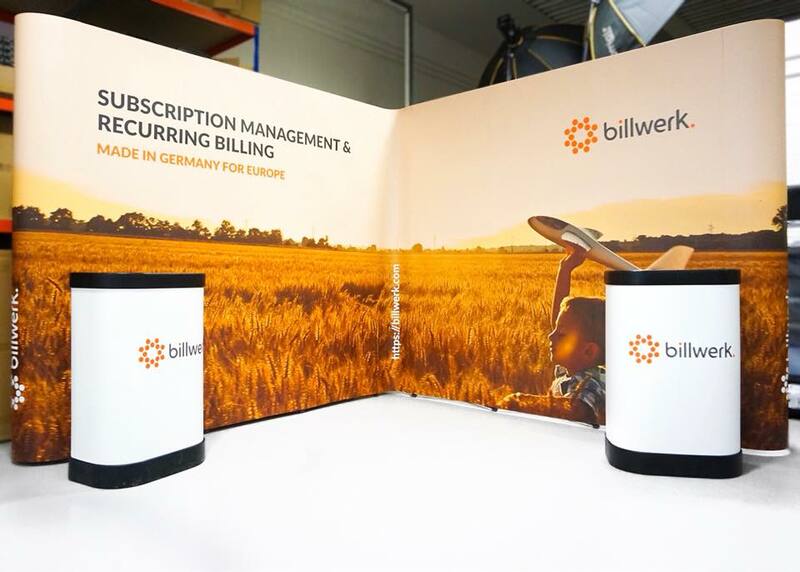 This linked pop up exhibition stand bundle we produced for our client Billwerk features striking photography and two key areas of text. Those areas are a logo and a brief summary of the business; a tagline of sorts. This minute amount of text doesn’t hinder the impact of the image, but it provides customers with all the information they need to know at first glance. This is a superb example of how you can still have bold imagery as well as text without creating a display that is muddled and confusing. As previously mentioned, photo backgrounds won’t work for every business. When this is the case, text can be what your brand harnesses instead. 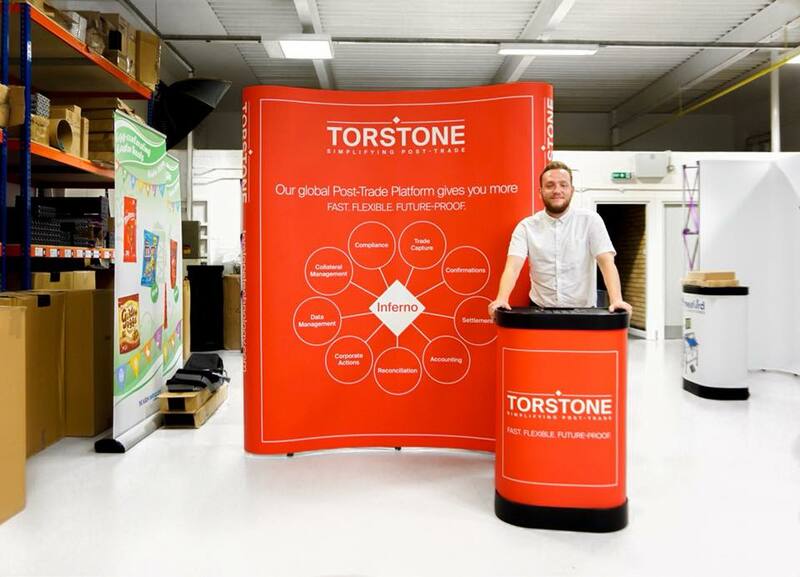 Our client Torstone Technology went down this route and created an equally stunning pop up display stand with very different design elements to the ones we have just looked at. They used a bright solid colour background and contrasting white text to make an exhibition stand that will stand out from the crowd. The text is neatly organised into a diagram which is clear to read – even from a distance. This is a key thing to consider when using text in a pop up stand. Most people will see your exhibition whilst walking by – meaning the words need to be short, clear, large and well organised. The brand logo on this pop up stand is clear and bigger than the rest of the text, making the display instantly recognisable to passers-by. Equally, the tagline is larger, making it the second area eyes will go to when viewing this exhibition. The entire display flows well and looks visually enticing, even though there are no images. Pop up exhibition stands are incredibly versatile marketing tools and work great by themselves, but sometimes incorporating other elements into you display can complement the design and overall finish to a higher quality. This curved pop up exhibition bundle for our customer PA Consulting includes the main stand and Zeus case with graphic wrap as standard. The benefit of having a bundle is that you can enhance your branding and exposure at no added cost. It also allows you to create an exhibition stand that has dimension and structure. Like with text needing to be organised, the stand itself also needs to be organised in order to attract clientele. By adding a counter you are creating a professional meet and greet point for visitors. This gives people a clear idea of where they should go when approaching your stand, as well as added graphic space for you to place your branding. PA Consulting decided to have a block colour background and logo with a tagline on their counter. This enhanced the look of the overall display because it didn’t detract from the pop up stand, but it had the relevant branding to provide continuity and uniformity. 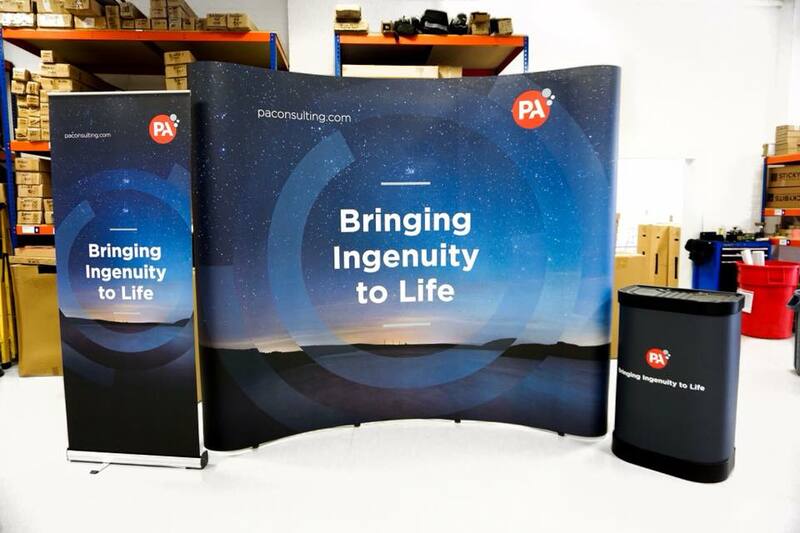 PA Consulting also added a roller banner to their exhibition display which followed the same design as the pop up stand but on a smaller scale. Once again, this expanded their branding and enhanced their promotion without compromising on the fluidity of the exhibition itself. If extra components isn’t something that you have room for within your exhibition space, double-sided printing is an easy and effective way of enhancing your branding without taking up more room. Double sided pop up stands are especially useful when you are exhibiting in the middle of a hall and need to be seen from all angles. Despite everything we have just said, sometimes simple works the best. This straight pop up exhibition stand we produced for The Kingsborough Church doesn’t have any photographs, it lacks a block colour background and there are no complementary elements to go with it. But it works. And it works well. Even though the pops of colour only take up a third of the overall graphic space, the muted design serves its purpose because it still looks aesthetically pleasing. What this stand has in common with the ones exampled above is that there are no clashing colours and everything is clear and concise. Organisation is key, meaning the speedy and simplified approach of pop up exhibition stands works well for marketing and promotion. 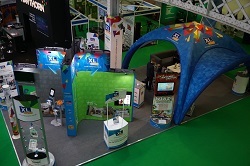 Here at XL Displays, we have over 20 years of knowledge and experience in the events industry. You can trust our experience and advice because it’s expertise we employ at our own events when we market our brand to the industry. To the right is a picture of our exhibition stand when we went to the Event Production Show 2018. We used every aspect of our space to promote ourselves through enhanced branding and awareness. We used an island pop up exhibition stand with colour coded sections to organise our vast range of products. Island pop ups work well when used in the middle of floor space and when a brand has many product ranges to showcase. We placed ours in the middle and focused the rest of our display around it, but island pop ups also work well alone. We colour coded our pop up to keep things organised and flowing. Colour coding areas of your pop up is a good way to separate different ranges in a simple and effective way. We complemented our pop up display stand with various other elements to create a bespoke display that took advantage of every inch of floor space. We used our X GLOO inflatable event tent as a central meet and greet area because of its size and durability. The X GLOO uses German engineering and shrugs off the hard knocks of exhibiting to maintain that like-new look and feel. Put simply, strength meets style. We used smaller and more modest marketing tools to enrich our stand, including multimedia elements such as a monitor bracket and an iPad stand. Experiential displays are growing in popularity due to the attention they draw. We use multimedia elements for the purpose of competitions as a way to attract a higher footfall to our display stand. By doing this, we are giving visitors the opportunity to get involved with our brand instead of just being talked at when they come over. It’s a great ice-breaker and a good way to start a conversation with your visitors. Smaller accents such as lighting and display plinths provide dimension and depth to your exhibition, which is why we use them regularly when we are exhibiting. Lighting is especially useful for drawing attention to certain products, as well as illuminating your brand in dark exhibition halls. All pop up exhibition stand kits come with pop up LED lights, meaning you don’t have to spend any extra money to make your exhibition stand out from the crowd and to make your design ‘pop’. In addition, Lumos towers are excellent for creating a unique display if you are looking for a slightly larger floor standing option. There are over 16 million colour combinations for you to choose from, allowing you to match your lighting to your company branding in a stylish and exclusive way. You can even sync your Lumos tower to music using a free app, creating an exhibition stand that is unrivalled in terms of contemporary creativity. Designing a successful exhibition stand is more than simply perfecting your design, but that’s where it all starts. Here at XL, we have a fully trained team of graphic designers who are on hand to help you with your pop up display. Whether you need them to help you come up with a design or if you already have your artwork, our graphic design team will use all of their knowledge and expertise to ensure that your display is as professional and high quality as possible. Once you have your pop up stand, it is worth speaking to our sales team to see what options – if any – you can invest in to make your exhibition display have that wow factor. 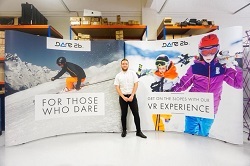 Whether it’s lighting, a roller banner or simply a promotional counter, our sales team will help you pick the best elements that are fit for purpose in order to complement your pop up stand and enhance your brand awareness in a sleek and stylish way. If you would like any more information about any of the products mentioned in this article, don’t hesitate to get in touch with us by calling 01733 511030. Alternatively, you can stop by our offices for a tour of our showroom and a meeting with one of our team.